Highlights and key takeaways from day 1 of AI Conference San Francisco 2017, including current state review, future trends, and top recommendations for AI initiatives. It’s the platform, stupid: Tech giants (Microsoft, Amazon, Google, Intel, IBM, and others) are investing heavily (in R&D as well as in Marketing) on the bundled offering of Cloud and AI. They are vigorously working on attracting the independent developers and start-up through open-source libraries with advanced capabilities, easy-access APIs to leverage proprietary code, and free/cheap access to cloud resources (compute and storage) to use their platform. Rana el Kaliouby, Co-founder and CEO, Affectiva gave the opening keynote on “The inevitable merger of IQ and EQ in technology”. She shared her bold vision of making machines “emotion-aware” through understanding human emotions, gestures, conversations, facial expressions and tone of voice. 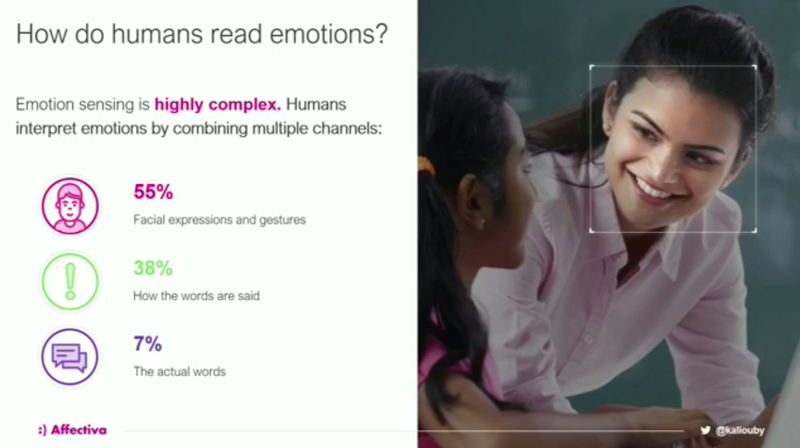 As we design AI products and services, we need to embed in them not just high IQ but also high EQ, because emotions are a big part of human life. Facial expressions are a big part of interpreting emotions. She gave a demo of real-time analysis of detecting emotions from human faces in a video. Besides facial cues, a good part of emotional understanding comes from speech through features such as tone, pitch, energy and tempo. Affectiva recently released cloud API for human speech. 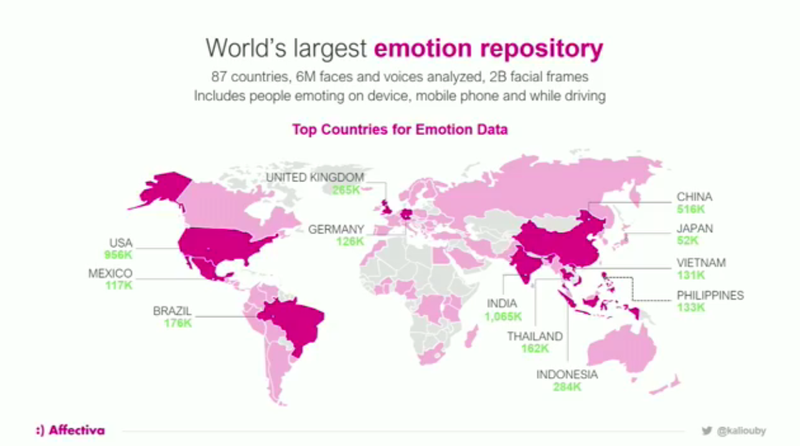 She talked about building world’s largest emotion repository to train and validate their emotion detection technology. She concluded her talk with the vision that “emotionally-aware” machines will help us solve the “loneliness epidemic” – we are more connected than ever (through technology) but we are feeling more alone. Ruchir Puri, IBM Fellow and Chief Architect of IBM Watson, IBM delivered the keynote on “Engineering the future of AI for businesses”. While perceptual AI (such as describing a picture in a sentence) has made great advances in the consumer space, few of those methodologies (such as crowdsourcing) can be used for enterprise use cases due to standard challenges such as inability to share data outside of enterprise (due to competitive or regulatory concerns) and the rare expertise outside the enterprise to add value (in the absence of highly specific domain knowledge). Furthermore, enterprises are riddled with processes and things cannot change overnight to adopt AI algorithms. He mentioned that the primary language of the enterprise is PDF and many challenges still persist in reading a PDF from its scanned image. Deep neural networks need massive amount of labeled data. 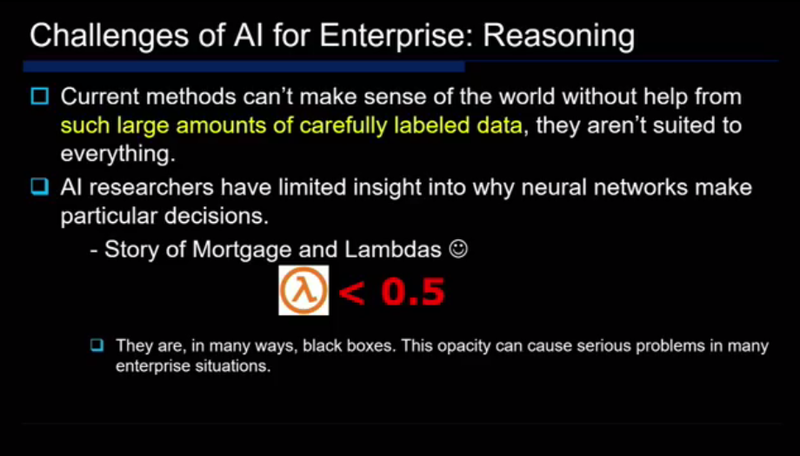 Enterprises have lots of data, but very little amount of labeled data, and thus, enterprise AI is mostly about learning from small data. Yet another challenge in enterprise AI is that it is not sufficient to merely have a data model that works; often the AI results need to be explained and shared in human-understandable form – this is where techniques such as neural networks pose a serious problem. Ben Lorica, Chief Data Scientist, O'Reilly Media and Roger Chen presented an overview of “The state of AI adoption”. 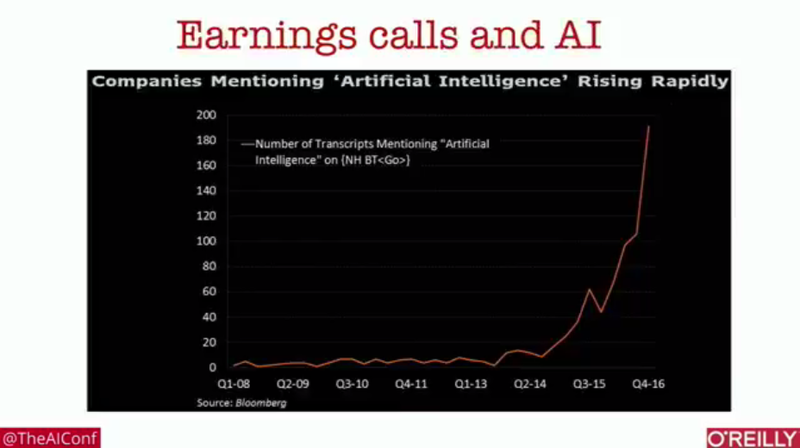 As reflected in the quarterly financial earning reports of public companies, AI is increasingly gaining importance in the business strategy across industries. AI is one of the key frontiers of innovation and companies cannot afford to be left behind. 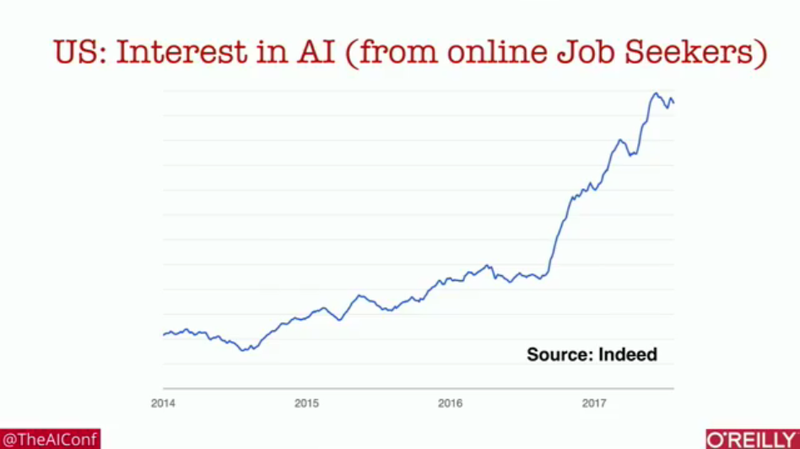 Despite huge interest in the potential of AI, the adoption across businesses has been slow primarily due to the challenges of having clear use cases for AI applications and of hiring the right AI talent. 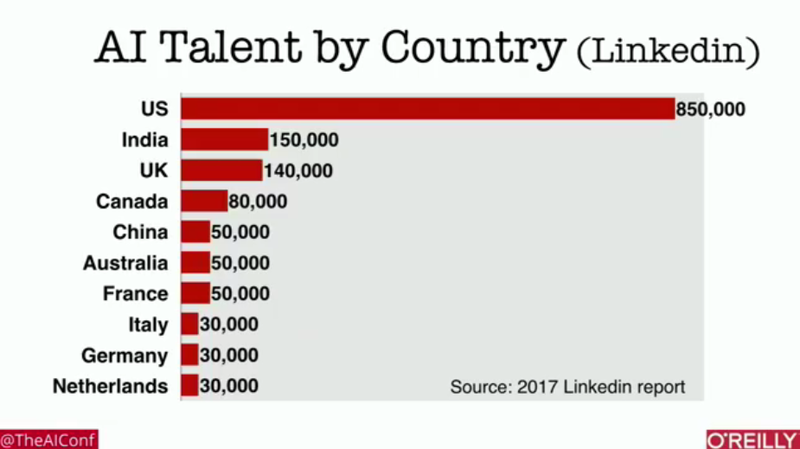 Geographically, the growth of AI has mostly been dominated by US, as evident from the increasing number of AI jobs and AI skills on resumes. The growth of AI is not limited to academic research. Rather, AI is garnering a lot of attention from startups as well as VCs.